Curators at the Smithsonian's National Portrait Gallery in Washington have examined how celebrity images are cultivated and how they've evolved for the new exhibition "Eye Pop: The Celebrity Gaze." The exhibition includes dozens of new paintings, photographs, sculptures and digital portraits by leading artists that the museum acquired in recent years. "Eye Pop" will be on view through July 2016. Curators narrowed their list to 54 influential figures still living and active in their fields. Images of Brad Pitt, Barbra Streisand, Oprah Winfrey and Katy Perry made the cut, along with the founders of Google, star architect Cesar Pelli and food-to-table pioneer Alice Waters. Asma Naeem, one of six curators on the exhibit, said everyone these days is trying to reach celebrity status in some way, posting carefully selected images on social media sites to shape how they are seen by others. Quick access to information and photos online makes it easier to recognize stars in many fields. "Celebrity is really a very elastic concept now. It's far-reaching. It dips into fields that we would never have considered typical of celebrity 50 years ago," Naeem said. "It also has many different edges to it. Celebrity encompasses not just somebody who is accomplished and who garners our admiration but somebody who has also fallen has been able to put themselves back together again." Britney Spears' new portrait at the Smithsonian was created by multimedia artist Luke DuBois as a mashup of images from her music videos. The small piece is housed within a decorative gilt frame that would normally surround a religious artwork, playing on the idea that the pop icon is an object of veneration. Instead of playing Spears' music with the moving images, DuBois used the white noise reverberations of an Italian basilica. 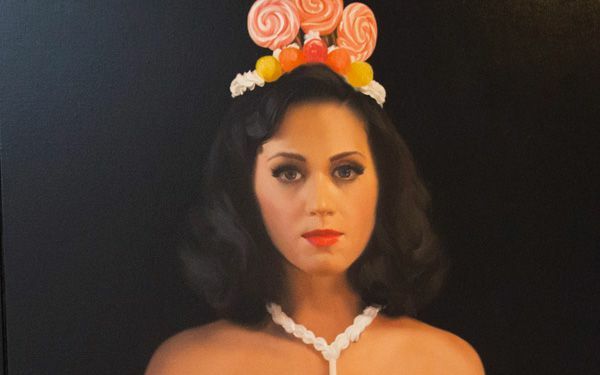 Katy Perry's portrait was the culmination of her collaboration with artist Will Cotton, who designed the candy-land theme of Perry's "California Girls" music video. Cotton went on to design the album cover and then painted Perry's portrait dressed in a cupcake wrapper and candy tiara. Perry visited the National Portrait Gallery after the painting arrived and took a selfie with her image. "This to me shows how art is intersecting with celebrity-making in such interesting ways," Naeem said. Other artists would try to strip away any notion of celebrity, which also drew the attention of museum curators. Pitt's first painted portrait is being revealed for the first time in the exhibit with a newly acquired large-scale piece by artist Colin Davidson. The two began collaborating in 2012 when Pitt asked Davidson to give him painting lessons. Pitt was drawn to Davidson's style from other portraits. When they agreed that Davidson would paint Pitt's portrait just before the actor's 50th birthday, "he knew it wasn't going to be the airbrushed, flattering way in which we normally see him," Davidson told The Associated Press. Instead, the artist spent time with a jet-lagged Pitt, talking and drawing, trying to catch a raw moment of humanity. 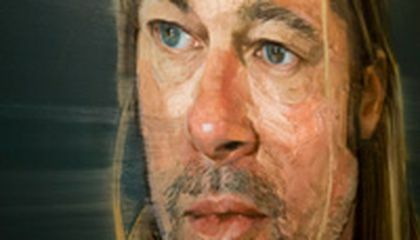 The result is a rugged picture with thick brushwork that captures the scruffiness of Pitt's face and long hair, with a glassy-eyed look. "My interest in him was very much as a fellow human being, rather than as the actor or producer or celebrity," Davidson said from his studio in Belfast, Northern Ireland. "I'm putting forward something else and actually encouraging us to look at people again as fellow humans, rather than anything else." Critical thinking challenge: What has changed to allow people other than athletes and entertainers to become celebrities? Its pretty cool that they are making these changes to adjust to how society has changed. Also it is nice that the artists didn't try to alter their paintings to make the celebrity not have any flaws as in where it states he was drawing a human being. This article was about how there is an art exhibit at the Smithsonian called Eye Pop:The Celebrity Gaze. The idea for this exhibit came from the idea of how people are celebrities now who would have never been considered "famous" fifty years ago. Some examples of this are You Tubers who are making a name from themselves from behind a camera. Scientists ,technology geeks, designers, and writers are all yet another example of people who are famous for something other than being an entertainer or athlete. The art exhibit will showcase 54 influential figures who are still living and active in their fields. Some of the celebrities being featured in the exhibit are Katy Perry, Brad Pitt, Oprah Winfrey, and Alice Waters. I think that this is a very interesting thing. I think that this makes sense to put some of the biggest stars in something grand like this, however, I don't think that they are that important that they need to be in the Smithsonian. Critical thinking- People are famous because the are looked up to and admired. People in movies and athletes are not "role models" to as many people as they are universally known. Other figures such as the president our Lewis and Clark, are universally known but respected for their brave and bold choices and discoveries. If a person is universally recognized by a certain thing, they could be considered a celebrity. The thing that has changed to allow this is that people admire people other than the entertainers and athletes. I think it's very interesting how celebrities can be famous for whatever they want to do. But, I personally do not see any reason to replace historical pieces of work with new mash-ups of celebrities work. I find it absurd that a Britney Spears collage would take over a historical piece of work. I can understand if it's a certain museum for celebrities. But if it's being put in an older museum, I don't think it should belong there. I think that this makes sense to put some of the biggest stars in something grand like this, however, I don't think that they are that important that they need to be in the Smithsonian. they definetly should be. asome artical.